Keep your minnows frisky and appetizing with this 8-qt. 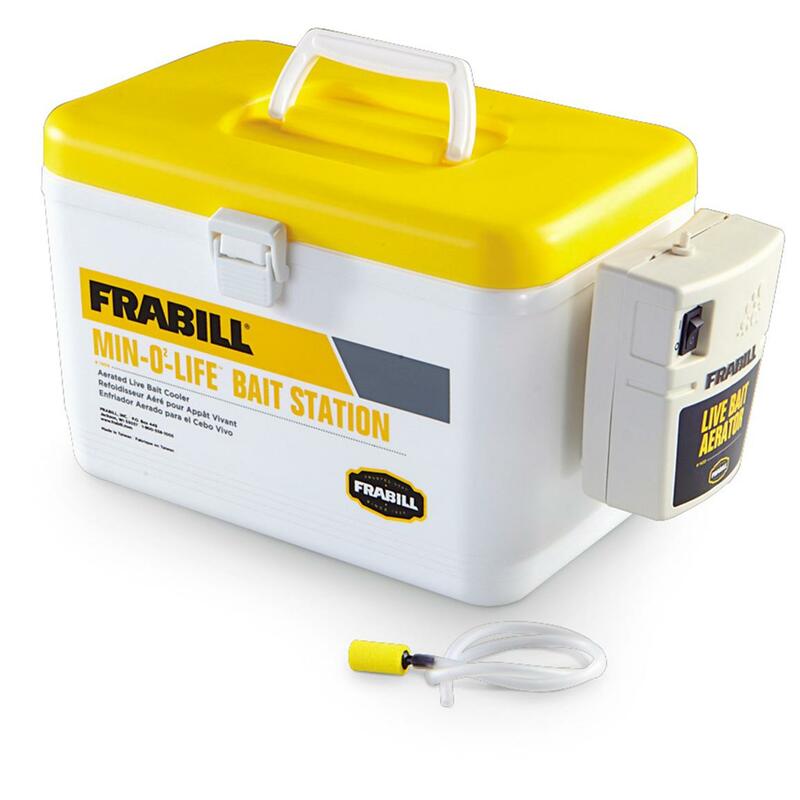 Min-O-Life Bait Station Cooler. You know, it's the minnows that really shake their booty underwater that catch more fish. And what makes 'em so lively? Oxygen, and plenty of it. This new Min-O-Life Cooler is the perfect choice for keeping your minnows full of life. This 8-qt System effectively sustains two to three times the volume of bait kept in standard minnow buckets! No more emptying and re-filling of bait buckets, and no more belly-up minnows when you get to the lake. Essential for ice fishing! Compact size stows easily in boat, ice house, etc. Bait's expensive, make sure yours lasts! Please Note: Style may vary. Sorry, no choice. Frabill 8-qt. Min-O-Life Bait Station Cooler, Yellow / White is rated 4.1 out of 5 by 18. Rated 4 out of 5 by FishingPastor from Good product at a great price!! I have not used it yet but I can't wait to try it out. Rated 3 out of 5 by Jdogice from Lid leaves alot to be desired The first outing with this, water was sloshing out everywhere. The lid has a cheap gasket that doesn't look like it does much. The lid also seems to be hollow because water will also come out of the hinges where they mount. The hinges and latch are light plastic. My only beef is with the lid and its attachment points. This is a great idea just needs improvement. The aerator runs 24 hours on good brand name alkaline batteries, which I think is acceptable. I use it for two dozen minnows and I think you probably put 5 dozen in easily. Rated 5 out of 5 by David from Great this is got to be the most user friendly bait bucket I have owned. I especially like the built in dip net to retrieve minnows. The air pump is a nice feature also. I can leave the pump running all day without the batteries going dead. Rated 3 out of 5 by Bill from Minnow Comes Up Short Whiles the price and quality of the Cooler is great compared to the same item locally, there is one big disappointment for me. This things eats Batteries! I have to replace the Batteries daily. I had hoped to be able to keep leftover Bait alive for a few days until I could use them again. My previous Airator lasted for weeks on a Lantern Battery. Rated 4 out of 5 by zeke501 from latch it seems to me that the latch that secures the top, may be a weak point on the unit. it hasn't failed yet, but I have just used it a couple of times. but other than that it works fine. Rated 5 out of 5 by Barb from GREAT ITEM My husband was very excited when I gave this to him for our anniversary! He keeps his minnows in a huge Styrofoam cooler and has to put them in a small container to take with him fishing. He has not used it yet, but if it works as well as it claims, he will be happy! VERY sturdy, well made, but yet compact enough to take with you each time you go fishing! HE WAS VERY HAPPY WITH IT! Arm your fish house with a flexible rod holder. Keeps your rods safe and secure.